Our seniors got their season off to the best possible start with a hard fought win at home to Aghaderg. Both sides were level at the interval before the visitors led by four points with five minutes of the game remaining. The Fin dug deep to score 1-02 to win the game by the minimum. Final score Aughlisanfin 3-09 Aghaderg 2-11. Next game is away to St Michaels on Tuesday evening. Faelan Murphy marking his senior team debut with a briiliant match winning penalty save. Our five minor players Eoin Lundy, Oran Flanagan, Jack Matthews, Callum Haynes and Ruairi Quinn also making their senior team bow. Well done lads. Before the match Marie Mulholland, proprietor of Mulhollands Sports Bar, presented the new set of team jerseys. 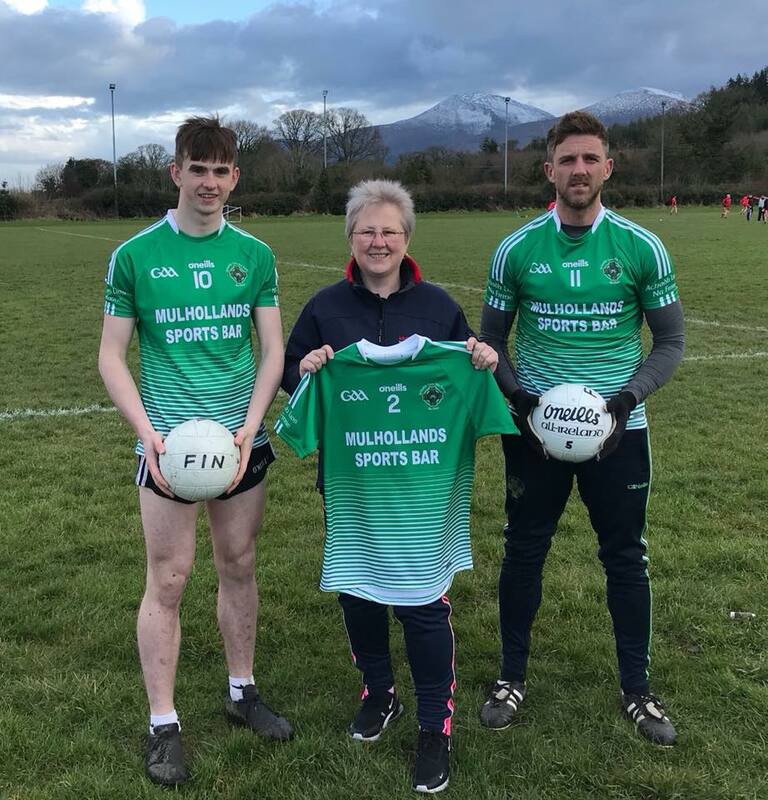 Mulhollands have supported our senior team over the past seven years and we are very pleased for their continued support. 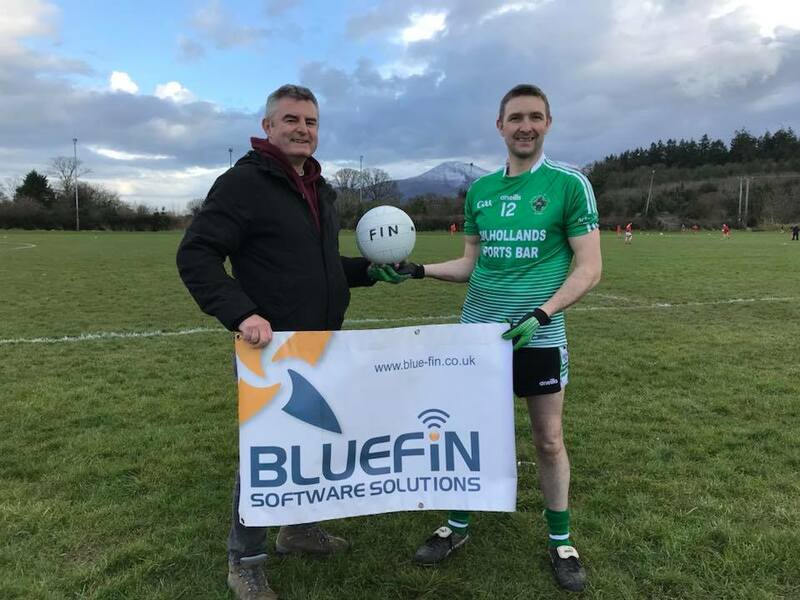 John Walsh, a committee member and owner of Blue Fin Software Solutions, also presented the match ball. Thank you to both. 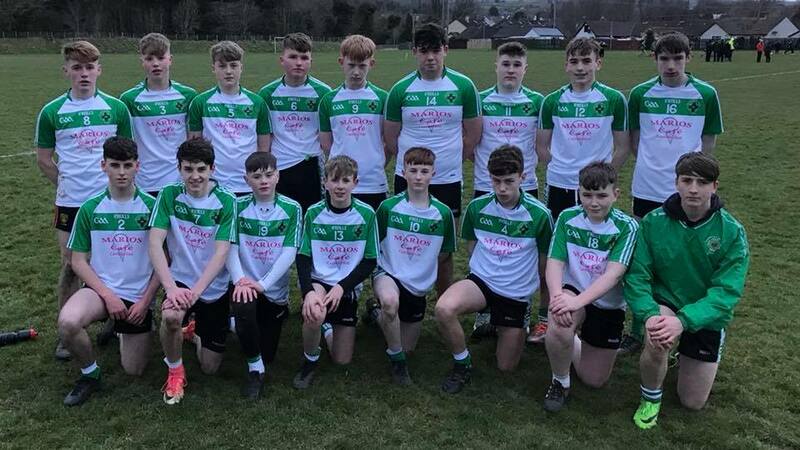 Our U16’s had a comfortable win at home to parish neighbours Castlewellan last Thursday evening in their second All County qualifier. After a below par performance the previous week with a depleted squad the Fin recorded an emphatic win on the night. They edged the match ups in most sectors of the field with the full forward line unplayable at times. Conor Donnelly returned to score six superb goals. Fellow full forward Morgan Croskery scored 1-05 and both gave the Town rearguard a torrid evening. Croskery also smashed an effort off the frame of the goalposts. Ryan Morgan got the last score of the game having started in nets for the first half and kept a clean sheet. Corner forward Rhys Clarke dropped deep to good effect linking the play. While the forwards get all the plaudits for their scoring exploits it would remiss not to mention one of several man of the match contenders. Ethan Lyttle was a rock in centre full back flanked by the impressive Marc Quinn and Conor Steen. The half forward line of Conor Matthews, Dermy Lavery and Rory Walsh were the springboard for many attack. When snuffing out the Town threat their transitional play through the midfield pairing of Aaran Flanagan and Damian McMullan to the forward line was top drawer. The half forward line of James McCabe, Dylan McKibben and Peter Walsh also contributing to a real team performance. Substitute goalkeeper Odhran Maguire and half forward Owen Oneill also came on to help see out a very deserved victory. Aughlisnafin (15 aside): R Morgan (0-01), C Steen, E Lyttle, M Quinn, C Matthews, D Lavery, R Walsh, D McMullan, A Flanagan, J McCabe, D McKibben, P Walsh, R Clarke, M Croskery (1-05), C Donnelly (6-00), Subs: O O’Neill, O Maguire. The three St Johns players that featured in the game, Damian, Ryan and Peter have settled in very well and are already in tune with their team mates for the season long lease at this grade. Next game is away to Saul this Thursday at 7 pm. Aughlisnafin U16’s after their victory over Castlewellan in an All County League qualifier. Ballylough minors lost at home to Carryduff on Sunday afternoon. The visitors led by four points at the interval before a strong second half showing saw off the Loch challenge. Scorers for Ballylough were Caolan Burns (1-01), Eoin Lundy (0-03), Oran Flanagan (0-03), Shea Croskery (0-03) & Tiernan McCullough (0-01). Final score Ballylough 1-11 Carryduff 4-13. The next game will be away to Castlewellan next Tuesday 17th April at 7.15 pm. Our U14’s are at home to Ardglass on Monday 16th April at 7 pm. Our U12’s are at home to Dromara in a re-fixed game this Wednesday at 7 pm. They will also be away to Bredagh this Sunday at 11 am. The Go Games for Year 6’s will take place this Saturday in Bryansford with games against the host club, Ballykinlar, Castlewellan and Teconnaught. The quiz night was a brilliant success. Thanks to Mulhollands Sports Bar for hosting and to everyone who organised and supported the event. It was a great nights craic. Lotto numbers (30/03/2018) were 1, 5, 13, 27. No winners. Lotto numbers (06/04/2018) were 5, 18, 22, 18. No winners. Jackpot 5, 18, 22, 28. No winners. Jackpot now stands at £3,200.